As a child, one of the best things about vacations for me was staying at hotels. The smell of fresh linen, the soft beds, the ever so courteous staff never failed to bring a warm smile to my face. Even after so many years, it all still feels the same. The way hotels make you feel might not have changed but the way they do it has. Technology is now the driving force behind every industry. The hospitality industry is no exception. One of the most popular and sought-after technologies for print marketing is QR Code. 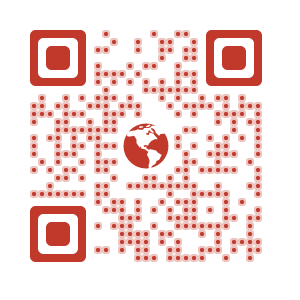 QR Codes are popular in US, UK, Canada, China, Hong Kong, Singapore, and India. See the list of 14 ways various industries are using QR Codes. The Westin Bayshore Hotel, Vancouver, Canada adds a personal touch to welcome guests. A plate of decorated cookies welcomes guests on entering the room. The plate holds a Facebook, Twitter, and a QR Code cookie. 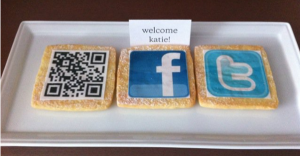 Scanning the QR Code on the cookie displays a personalized welcome message for the guest. In a bid to increase security, hotels are moving from regular keys to access cards for rooms. The latest addition to increase safety is a QR Code lock. Developed by Hotek, the QR Code lock uses QR Code as the key. Guests can enter their room by scanning a unique QR Code generated on their smartphone. Best Western, Paris shares a QR Code with their guests at check-in. Scanning the QR Code gives the guest access to a PDF listing services provided by the hotel. This saves guests the trouble of calling the reception for information. QR Codes in newspaper ads are an effective way to engage print media audience. 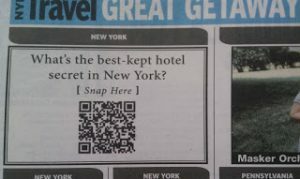 In 2011, the Park Lane Hotel, New York shared an ad in The New York Post featuring a QR Code. Scanning the QR Code lead the readers to the hotel web page. Besides information about the hotel, readers also got a 25% off on any room booking in the hotel. Sharing stories of the past eras is an effective way to engage guests. 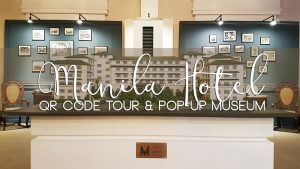 In July 2016, The Manila Hotel, Manila, displayed pictures, and artifacts. The display included artifacts gathered since the hotel’s opening in 1912. 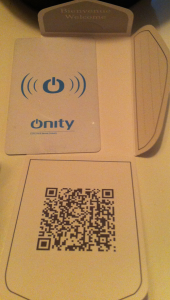 The hotel put up metal plates with QR Codes across various sections of the hotel. Scanning the QR Code allowed guests to learn the significance of that section or display. Gone are the days when hotel guests had to share their feedback in a bulky register placed at the reception. QR Codes are the latest and better alternative to collect feedback. Plaques with QR Codes are a common site at hotel receptions. Scanning the QR Code leads the guests to an online feedback form. 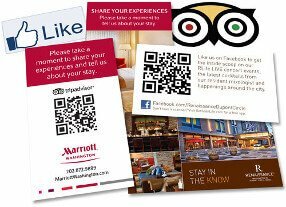 Uses of QR Codes in hotels are not restricted to only the above examples. QR Codes pose many other opportunities for better engagement. If you are a hotelier who’s looking for better ways for marketing and customer engagement, use QR Codes.